SOCHI, January 30. /TASS/. 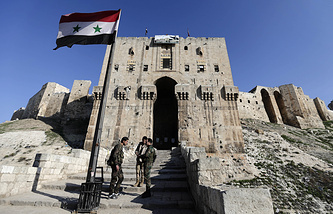 Beijing is ready to participate in the post-war reconstruction of Syria in keeping with its potential, Chinese Special Envoy for Syria Xie Xiaoyan said on Tuesday. "China is ready to take part in the post-war reconstruction of Syria. We will continue our assistance in keeping with our potential," he said. There is a need to resolve the Syria issue to eliminate the threat of terrorism, which otherwise would spread through the region, he went on. "Although the Islamic State terror group [outlawed in Russia - TASS] has been defeated is Syria, its remaining members, as well as other terrorist groups, such as Jabhat al-Nusra [outlawed in Russia - TASS] and the East Turkestan independence movement, still exist, so the war on terror is far from being over," the Chinese envoy said. "We call on the global community to continue the fight against terrorism, which poses a great threat not only to Syria but also to the region and the entire world. China urges all countries to cooperate in the name of combating terrorism," he added. China has been maintaining contacts with both the Syrian government and opposition in order to facilitate the resolution of the conflict, he said. "The Syria issue may only be resolved through talks," he said. "In order to achieve this goal, we continue to maintain contacts with various parties, including the government and the opposition," the Chinese envoy pointed out.